MLAF: I noticed that you used particular titles of books in the context of the story (like Thomas' Under the Milkwood)-Did these titles have a particular significance to you or are they simply there to make a point in the story? AD" All of the books quoted have a special significance for me. They are all works that I've loved and which stand, according to me, as litterary milestones. They also, for some of them, have a link with the story I'm telling (especially Lewis Caroll, Rilke, Goethe... actually all of them, when I come to think of it!)" MLAF: Myriam (the lead character) is a very complicated character who has lived a full but hard life-Yet, somehow she remains a figure of glamour in the eye of the reader? How did you manage to pull that off? AD: "I'm very happy and touched that you should get this impression. I guess that her sensuality is the quality that saves her from despair and shabbiness. She's always ready for an aesthetic/sensual emotion. There is also a certain generosity in her, and a particular kind of naïveness which contributes to keep her young... I think." MLAF: Did any of your previous writing efforts affect the way you created this book? AD: "To me, evry book is a step on the way towards the next one, although I never know what's ahead. But the way I created this book has also been affected by my efforts as a translator. 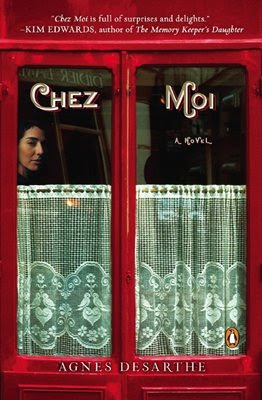 I owe a lot to Cynthia Ozick and Virginia Woolf, whose novels I was working on when I started writing Chez moi." MLAF: In what ways are food and drink important in your everyday life? AD: "My kitchen is like a loboratory. I work there, I think about food, but also about words. One of the reasons I've started writing Chez moi was because I realized I was spending more time at my stove than at my writing table. I daydream a lot about cooking. It's a very creative activity and one which allows me to be certain I'm going to please people around me (a very important and deep anchored craving in my life)." MLAF: What is the most memorable meal you have ever had? AD: "It was in 2003. We were broke. I was depressed. We decided to go a very good restaurant in Honfleur ( Normandy ). It was heavenly. I went back one other time (I had earned a little money with one book or another) but the chef had changed it was just ordinary. I can't remember what I had to eat. My memory of the dinner itself is very dim. I'm almost certain that the great feeling had to do with spending when broke. Generally I favor home-style cooking and I've never been to a starred restaurant.